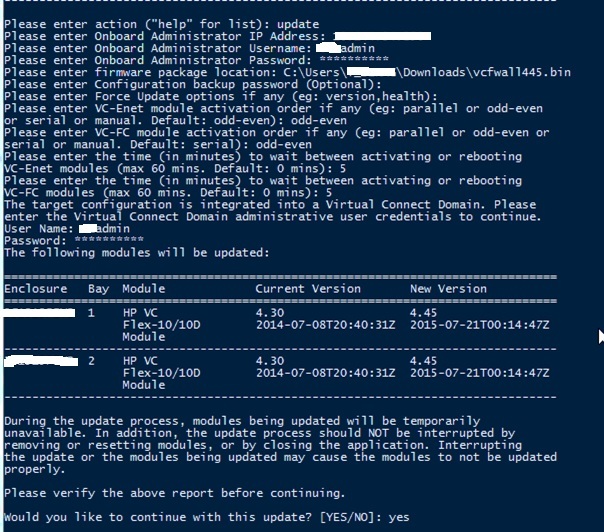 ← Powershell script to audit the VMware vCenter\ESXi \ Windows logs. We need to download and install the HP utility-Tool called HP BladeSystem c-Class Virtual Connect Support Utility ( VCSU ) to upgrade the HP Virual Connect Flex Module . By using the below link , download the tool and install it in your local machine. Depends on the model download the latest firmware . HP Virtual Connect Flex-10/10D Module for c-Class BladeSystem. Use the below command to see the help and other option. We need to provide the HP OA IP and its login. Then it will ask for the Virtual Connect Domain login. Next will show the steps to take the configuration backup. Next we need to point the firmware download location. Next it will ask for the password for the backup and also if any force update option. Since it is Optional and no need , Just give enter to move to the next step. Next it will ask the wait time to activate of bays and reboot. Provide it as per your environment need. Next it will prompt to connect the Virtual Connect Domain and we need to provide the username and password. Once the update is completed , It will start the activation. It was there for around 15 mins at 20% and noticed that one of the firmware it got activated .. Almost after 25 mins and around 20% of the activation , found blades which is running on the enclosure stops pinging and all came up after around 5 mins. So make sure the blades are configured with proper redundancy to avoid any downtime on blades. 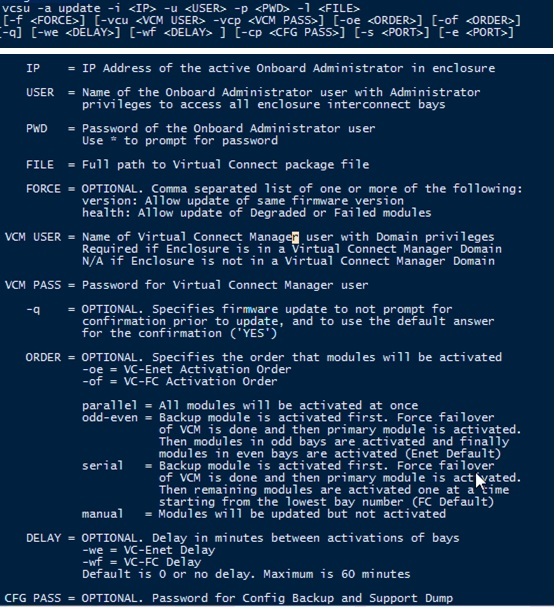 This entry was posted in Firmware upgrade, HP and tagged HP, hp c7000 enclosure, HP Onboard Administrator, HP Virtual Connect, VCSU. Bookmark the permalink.